Step 1 In a large bowl mix ground beef, minced onions, 3 cloves of the minced garlic, 4 tsp of Dr. Meaux’s Cajun Recipe Seasoning, eggs, Worcestershire sauce and the bread crumbs. 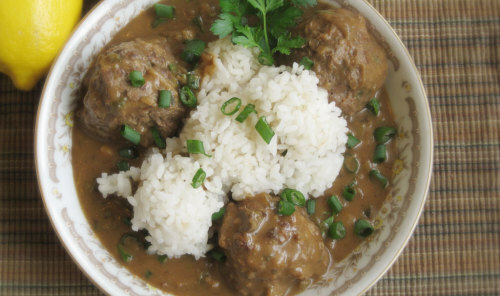 Form meatballs the size of a golf ball or ping pong ball. Step 2 In a large skillet melt butter on medium to medium heat. Add meatballs and brown well. Step 3 Add ½ cup of chopped onions and 3 cloves of minced garlic and mix gently throughout the pan. 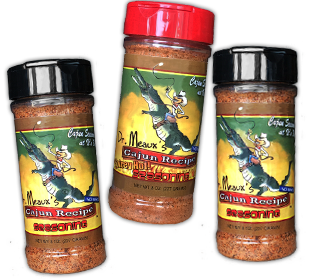 Cook for a few minutes then add water, bullion and a dash Dr. Meaux’s Cajun Recipe Seasoning. Step 4 Bring to a boil, reduce heat and simmer for at least 30 minutes (the longer it cooks the better it gets), stirring occasionally, adding water if needed (a little at a time) and until gravy is ready. Step 5 Add Dr. Meaux’s Cajun Recipe Seasoning to the gravy as needed for taste. Serve with rice and vegetables.